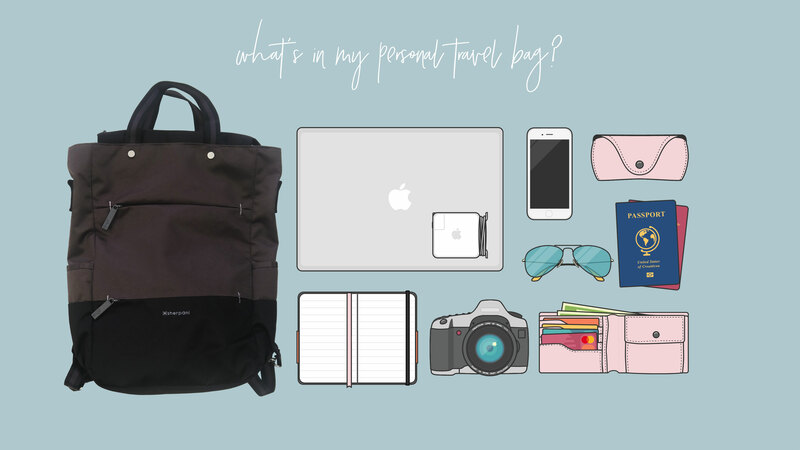 I've written about my past travel essentials and noteworthy travel items, and I'm glad that a lot of you guys find these kinds of posts useful. I love sharing with you guys the cool stuff that's being sent to me, because for one they're really darn useful and I love knowing I can share cool stuff you guys might need for your own travels (or everyday life) too! Right before I left for my Eurotrip last December, I received a package containing 4 items that couldn't have come at a better time for my trip. I'm glad to say I brought these items with me and they proved to be incredibly useful, even when I didn't think I'd need them. I was in need of a reasonable sized bag that could fit my absolute essentials when traveling: my 13 inch Macbook Pro, my cameras (I have two), makeup bag, my notebook, wallet, phone, passports, among other things. When I got the Sherpani Camden Birch 3 Way Women's Bag, I got excited upon seeing I could use it 3 ways with ease: a tote, a backpack or a cross body bag. It also included a padded laptop sleeve that fits up to a 15" laptop, and enough space for all my other stuff, especially my zeroshock multi storage pouch which included my 2 cameras + 35mm lens and my bulky makeup bag. There was even enough space on the outside pockets to put my notebook, passports, wallets, powerbank, etc. This bag was so useful and convenient when I traveled via plane or train, and even though my bag was heavy with all the gadgets in it, it was still comfortable. The best part about this Sherpani bag is that it's made with 100% recycled materials, which means it's sustainable fashion, so it's environment friendly. If you haven't already seen on Twitter, sustainable fashion is something I support, so this makes me really happy! You can find out more about Sherpani and their products on their website, facebook, instagram . I've a thing for slim wallets. 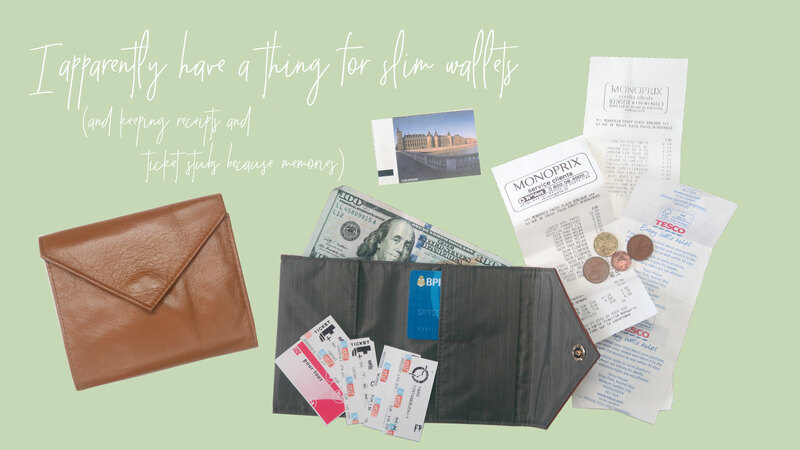 It's something I noticed when I received the Allett Wallet (Slim Original Women's Wallet) and I instantly loved it and immediately transferred my wallets contents into this one, not to mention my past wallets have gone from bulky to slim in the last two years. I used this wallet during my trip and still continue to use after. The Allett Wallet is made with nappa leather and features a divided cash & receipt pocket, ultra slim nylon interior and rubber gripped card pockets. Aside from the chic color and design, I loved that it had ample compartments to keep and separate 2-3 different currencies (I had to carry pounds/euros and some dollars), my receipts from doing groceries (and some shopping heehee), my metro tickets and tour tickets. The slim design is also great at being subtle, I've slipped this wallet into the back pocket of my jeans without feeling uncomfortable when sitting, and it doesn't create a bulky look when slipped into my coat pockets -- a pet peeve of mine. You can find out more about the Allett Wallet on the Urbanize website, on Facebook and Instagram. I've never used a packing tube for my underwear before, and let me tell you how absolutely life changing it can be. Confession time: I'm an absolute mess when traveling (actually, no, always but let's focus on when I'm traveling). Once I arrive at my destination and I've opened my luggage it's like all hell breaks lose. I've actually lost underwear because I was so unorganized with my things. The Electrolight Expandable Packing Tube by Lewis N Clark was specifically designed for long items such as socks, ties, belts, even shoes. In my case, I was able to store my bras, underwear and socks in it. It features an ultra-lightweight water and stain resistant fabric, mesh panels for visibility and breathability, and it helps minimize wrinkles -- or in my case, squishing my bras! Packing a medium sized luggage for winter wasn't the easiest thing. I had to fit 2 coats, 5 pullovers, 2 jeans, 3 tights, 3 skirts... I mean it was mayhem trying to squish them all in. I didn't want to just place my underwear on top of things, I wanted them all in one place, organized and easily accessible which was made possible by the packing tube. The bad news is, I was still quite messy with the rest of my clothes, the good news is the packing tube actually kept my underwear and socks organized and I never lost a pair of underwear or socks the entire 3 weeks. For more info on Lewis N Clark / the Electrolight Expandable Packing Tube you can visit the Urbanize website, or Facebook & Instagram. Here's an item I didn't think would be useful but proved me wrong. The Kiu Mountain Rain Bag Cover is exactly what it says it is, a rain bag cover. This Japanese brand features a bag cover with built-in drawstring to help protect your bag and the items inside from rain, it's foldable to a size as small as the palm of your hand which makes it easily transportable, and the best part is it's cute and functional as a shopping bag! We did a lot of grocery shopping in Europe and one thing we've learned is that it's highly recommended you bring your own shopping bags because it's better for the environment and plastic will cost you an additional 10 cents. This little bag always came in handy because usually, before heading back to the flat for dinner, we'd stop by the store to get last minute groceries we might need or want for the next few days. 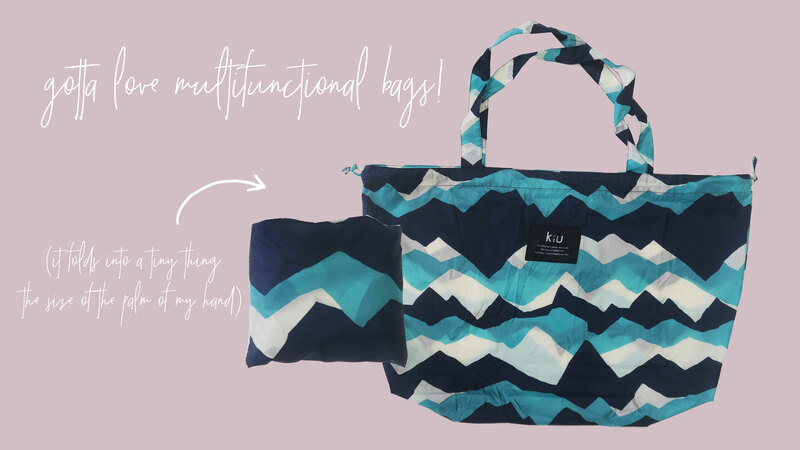 I have yet to use the bag during a rainy day, but I think this Kiu bag will come in handy for more grocery shopping and maybe even beach days due to the water resistant material. You can find more information on Kiu and their products on the Urbanize website, Facebook and Instagram. Disclosure: This is a sponsored post for Urbanize, Sherpani, Allett Wallet, Kiu, & Lewis N Clark. These items were gifted to me by Urbanize PH. As per usual, all thoughts, words and opinions are solely my own.